Heading North: on I 93 from Boston take exit 14, at end of exit take a left. Go straight thru three sets of traffic lights. At the fourth set of traffic lights, take a left on to Main Street. 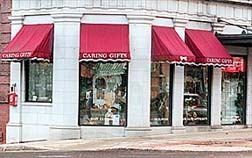 Caring Gifts is located at 18 North Main Street on the left. Heading South: on I 93 take exit 14, at end of exit take a right. Go straight thru first set of lights, at second set of lights you will want to take a left on to Main Street. Caring Gifts is located at 18 North Main Street on the left. Website maintained by KMB Graphic Designs.